A travelling exhibition drawn from video works shown within the Australian Video Festival 1986. 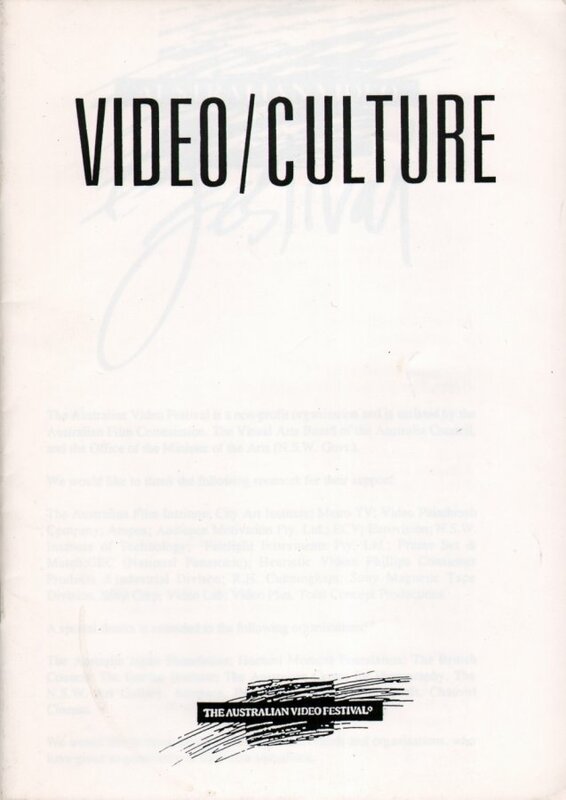 This five-part program gathers a selection of videos compiled from the award winning entries (with the exception of one) from the Australian Video Festival 1986. The title 'Video/Culture' indicates the emerging and evolving presence of video based production as a strategy of the electronic world we live in. Video is now entering its third decade and many would say that the first Australian Video Festival was long overdue, especially the tape makers themselves but it should be remembered that the development and organisation of such a festival is also an evolutionary process. 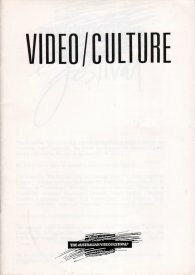 The thematic set-up of the 'Video/Culture' program, i.e. Electronic Imagery, Independent Music, Video Documents, Video Narrative, Sound and Image, seemed the best way to make selections as well as providing a starting point for further discussion of the video works themselves. As well as the questions of how, when, where and why of the exhibition of independent video and video art which were raised during the Australian Video Festival, distribution and financing structures were also high-lighted as important issues for the independent sector. Defining our roles especially in the broader use of video and increasing access to 'the means of production' are now very much on the agenda for the independent video maker and one of the main aims behind the production of 'Video/Culture'. Brian Langer, Sydney, December 1986. The first Australian Video Festival attempted to fulfill the need for a central exhibiting area devoted to all aspects of video, both conceptually and practically. This is not to suggest that video was a mysterious and underground activity prior to this Festival, but if video is to nurture in Australia, festivals of this type must be highly encouraged to succeed. The Festival contained curated international exhibitions from Japan, Europe, and USA, and a national competition categorised into six areas; Video Art, Video Graphics, Documentary/Informational, Drama/Narrative, Music Video, Student Video. Categorisation of this type invited a number of problems as simple classifications lead to misconceptions of what style a particular program should be. For example, Music Video in the popular context implies commercially orientated programming with little or no regard of more contemporary or experimental styles. Theoretically, all video is documentary as it documents electrical information at a given time. Perhaps thematically grouped videos would be more appropriate for this type of festival. There were numerous entries to the national competition that were initially shot on film and then transferred to video. Using the theoretical definition of 'documentary' as stated above, this technique is highly legitimate, but it does raise the question of what the similarities between film and video actually are. Quite often, videotaping with a camera is referred to as 'filming'. There seems to be little conceptual awareness of what does constitute a film or a video, and this type of confusion adds to the notion that video is the poor relation of film. Videos centred around the use of the technology were more apparent than firm content based work. This suggests that video still has the novelty stigma attached to it with an abundance of post-production special effects that are certainly pleasant to view but other than their immediate aesthetic qualities are of little consequence. Nearly one-third of all entries were student entries. The high standard of student work is reflected in the fact that ten of the works shown in this compilation have been completed by students from tertiary institutions. Although it is undesirable to have a separate student category, given that it is always inferred that because a work is produced in an educational institution, it is likely to be inferior, it should be remembered that these institutions usually have adequate video equipment that may not readily be available, both physically and financially, to the independent video producer. For this reason, public television groups must receive adequate funding to remain as low cost production facilities. It is now seen as a necessity that more video resource centres be established in the capital and regional areas. The excuse that geography is a limiting factor in the expansion of Australian video culture cannot be regarded as a plausible one, given that electronic transmission of visual information has been available for a number of years. Through sensible broadcasting legislation and the availability of video and media facilities to more independent producers and the more media disadvantaged groups within the community, together with the success of future activities such as the Australian Video Festival, video will grow out of infancy to a more acceptable and mature level. Selecting twenty or so video programs from a pool of over 400 would be an incredibly difficult task, and for this reason, the programs on the compilation have been selected from the 'award’ winners and awards of 'merit’. Attempting to group programs thematically is also difficult where there are only thirty or so tapes to select from. Although a true representation of any Festival is only hypothetical, this compilation should not be regarded as a direct indication of the work submitted - it is a compilation of work which has previously been categorically selected by various judging panels relating to certain areas of expertise. As a suitable idea for this compilation, the work has been thematically grouped into five areas: Electronic Imagery, Independent Music, Video Documents, Video Narrative, Sound and Image.